This is simply a stunning card, featuring the Angel Gabriel, the Shepherds and the Three Wise Men, with Mary and Joseph, at Jesus' birth. 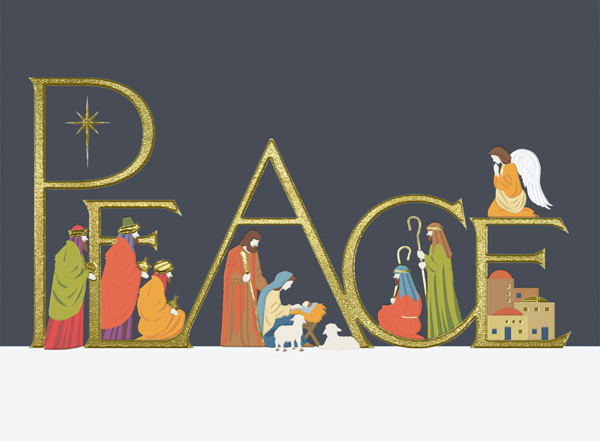 Each letter of the word peace has been embossed, so it is slightly raised and then printed with a slightly textured gold foil. Gold foil is also used to highlight elements of the design, such as the Wise Men's crowns and gifts, the Shepherds' hooks and the windows at Bethlehem. Printed on a quality matt board, this is a superb Christmas card to personalise. By purchasing the Come in Peace Christmas card 10p for each card you purchase will be Donated to the Charity of your choice from the Charities listed below.